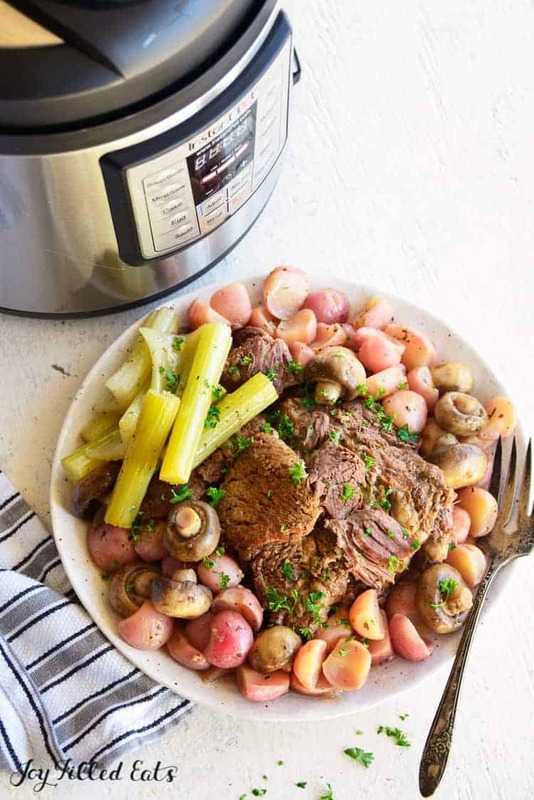 This Instant Pot Pot Roast Recipe is my go-to recipe for making that comforting and fork-tender low carb pot roast. I use low carb vegetables to replace starchy potatoes for that low carb factor. Savory roast paired with radishes and mushrooms and a handful of spices to make one incredible keto friendly dinner. We are still in full swing of winter, so reaching for hearty and comforting dishes is always on my menu. My Instant Pot has become one of my most used kitchen appliances. I love how if we want a Sunday roast I can now make it any day of the week, without needing to have it cook in the oven for hours. 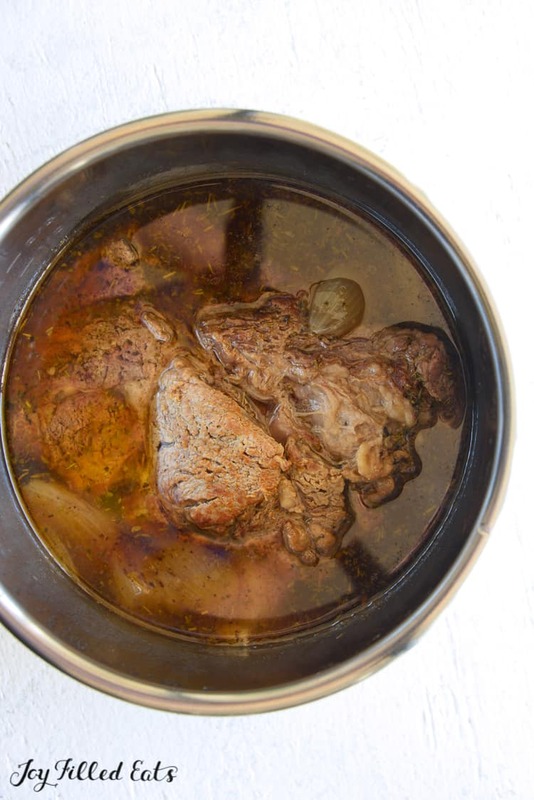 So you are on the hunt for that low carb pot roast? 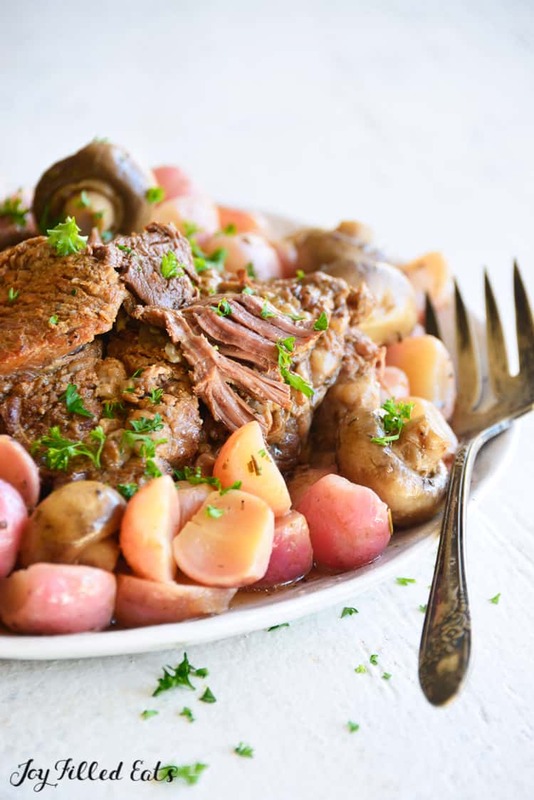 If you didn’t know pot roast is naturally low carb, it is the ingredients that pair with it that make it a low carb keto friendly recipe, or a high-carb dish. This recipe is low carb, thanks to the choices of seasonings and veggies I use. 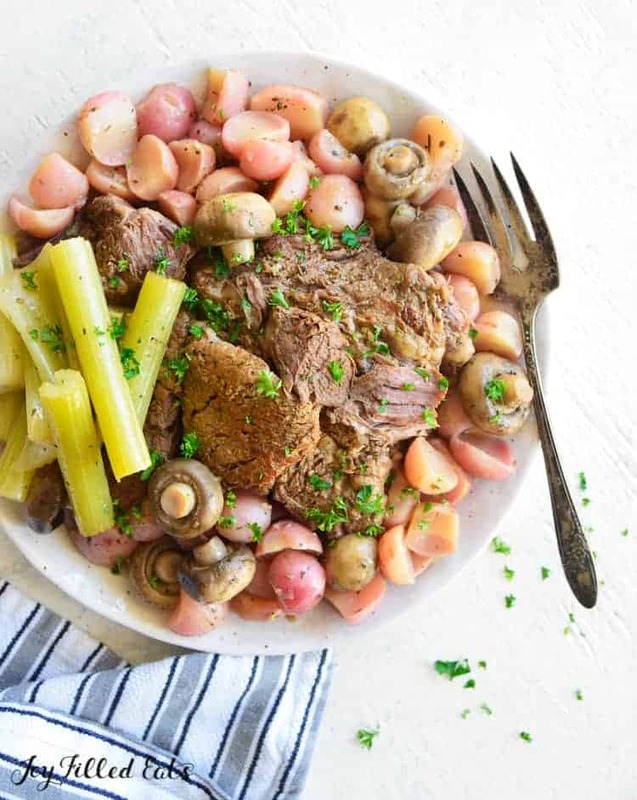 You don’t lack any flavor and young and old will dig into this savory Instant Pot pot roast recipe. Now let’s talk about cuts of meat for a good pot roast! Not all beef is the same, and some cuts will always outshine other cuts when making a pot roast. Chuck roast is what I gravitate towards when at the store shopping for a roast. You also might know this as chuck shoulder. This is the best meat for a pot roast as it has a beautiful marble of fat throughout the roast making it a prime cut of beef for that tender and flavorful roast. Some like to reach for more prime meat, and if that is the case, brisket will work. You will find a lot of time a brisket can give you a more grainy texture as it doesn’t have as much fat throughout. Here you have a leaner cut of meat in both round or rump. Both are similar and work good for roasts, try to find a roast that has some fat showing as you will get a more tender roast. 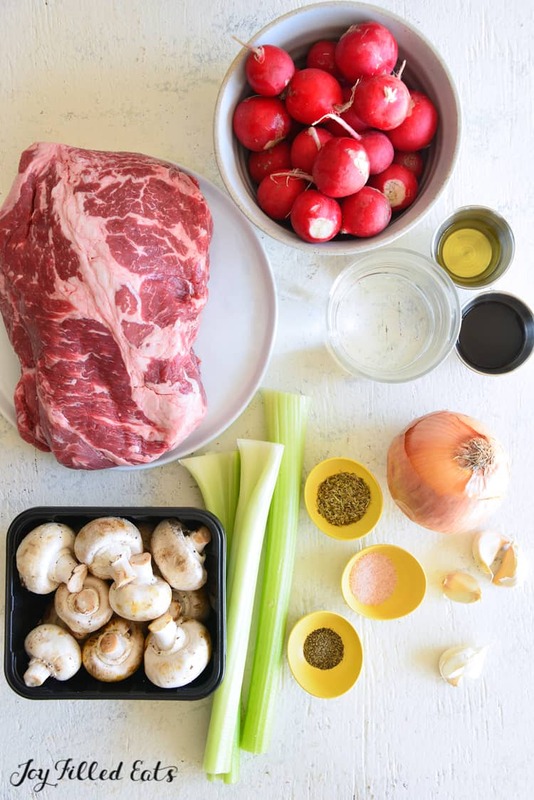 Give this keto pot roast recipe a try, and let me know how you and your family like it. A great dish to even serve company, as it is easy to make and serves a crowd. One of the biggest tips I wanted to ensure you followed was browning your roast in the Instant Pot. I have done this for years, it helps to lock in flavors, add depth of flavor during cooking. It is a super quickstep that I don’t recommend skipping over. 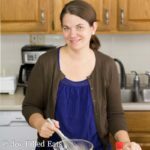 If your liquid is on the thin side when your done cooking, I have a keto friendly tip to make that liquid turn into a nice gravy. Use beef gelatin or even xanthan gum to thicken up the liquid. Just place on stovetop and allow it to reach a soft boil and add in your gelatin or xanthan gum. Ensuring you stir constantly, so it doesn’t burn. Mix until it gets thicker, then spoon over roast and veggies. Absolutely! Eating roast on a keto diet is great! Roast beef has a nice amount of fat, which is higher than ham or turkey. Just make sure if you are eating deli-style roast beef you limit, as it is going to have preservatives and added salt. You can store your leftover keto pot roast in the fridge for up to 3 days. Make sure it is in an airtight container so that you can preserve it. If you have any roast leftover after three days, you need to toss it. Yes, you can freeze pot roast. Place in a sealable freezer bag or airtight container. Then store in the freezer for up to 3 months. Thaw in the fridge the night before, and warm up in the oven or even your Instant Pot. Absolutely! If you have beef bone broth feel free to use it in replace of regular beef broth. You will gain some added nutrients, which is excellent for your body. 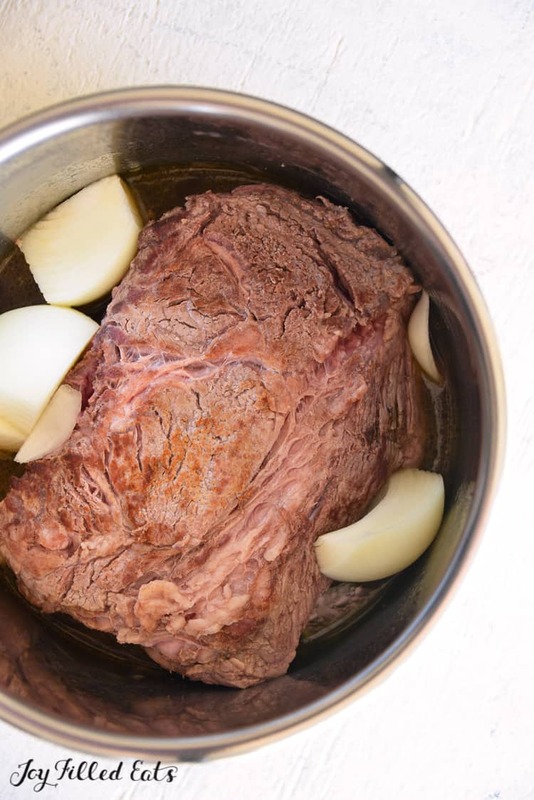 Have you ever made an Instant Pot Pot Roast before? 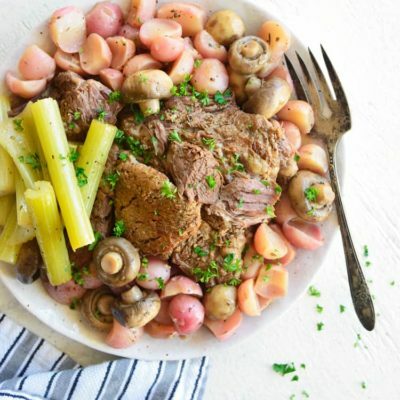 Pot roast is classic hearty comfort food and this Instant Pot Pot Roast makes it attainable even on weeknights! In this low carb and keto version, radishes are a perfect substitute for starchy potatoes. Turn the pressure cooker on, press “Sauté”, and wait 2 minutes for the pot to heat up. Add the avocado oil and roast and cook until browned, about 3 to 4 minutes per side, flipping once. Press “Cancel” to stop sautéing. Add the water or broth, Worcestershire, Italian herb seasoning, salt, black pepper, onion, and garlic. Turn the pot on Manual, High Pressure for 45 minutes and let it do a natural pressure release. 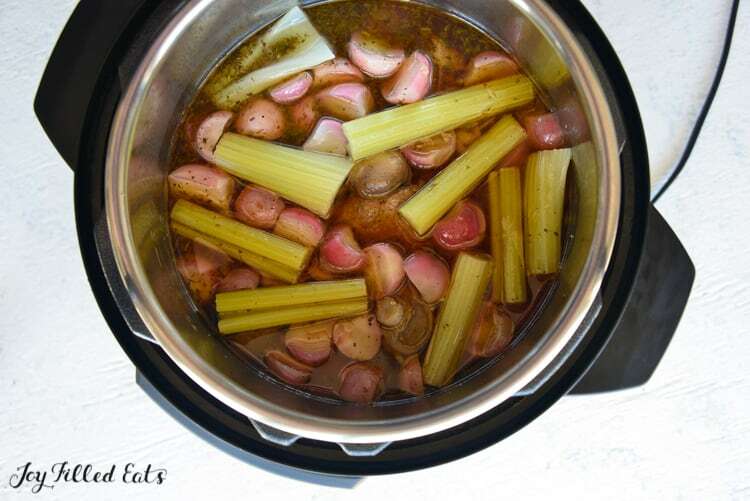 Add the radishes, mushrooms, and celery to the pot with the meat and liquid still in it. Turn the pot on Manual, High Pressure for 1 minute and let it do a natural pressure release. Remove the vegetables and roast, arrange them on a serving platter, and sprinkle the parsley on top. Strain the liquid and serve it alongside the roast and vegetables for drizzling on top. What a delicious looking dinner idea. Can't wait to try this for dinner for my growing teens. Love this! 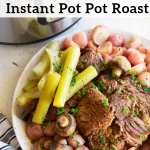 The Instant Pot is the perfect way to cook a post roast - comes out so flavorful, tender and juicy! I'm drooling just thinking about it.